We very much look forward to hearing the excellent performances of the finalists on Saturday 2nd March at Tudor Hall School, Banbury. Place: Tudor Hall School Bloxham Road Banbury. 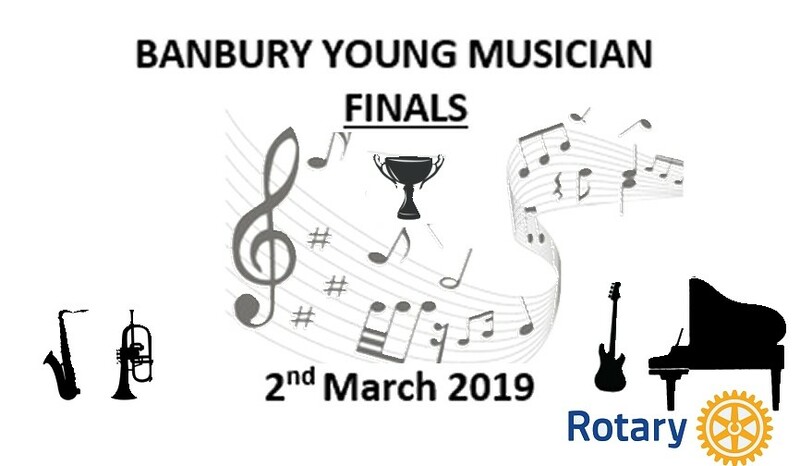 Congratulations to all those who have been successful in getting to the Banbury Young Musician of the Year 2019 Finals. Ruth Rogers explains the genius puppetry behind War Horse, bringing ‘Joey’ to life! Ruth Rogers is an actress and puppeteer whose notable performances include operating Joey’s Head in War Horse in the West End. Her fascinating talk includes an account of the auditions and rehearsals, a detailed look at how the War Horse puppets work and tips on how to perform as a horse. Ruth is the Artistic Director of The Canvas in East London, a cafe and arts space that hosts workshops, live arts events and ongoing debates. She is also the founder of the Body Gossip arts and education campaign and produces all of their theatre shows and short films. This years Purple4Purple Crocus Concerts to raise funds for the eradication of Polio are being held at St. Mary’s Church Banbury on Tuesday 6th and Thursday 8th March for full details follow this link. 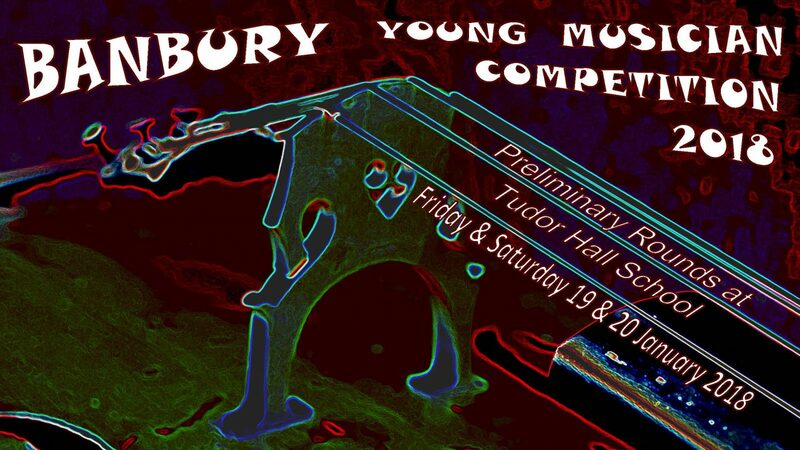 Entry to the 2018 Banbury Young Musician of the Year is now open. Full details, including guidance for preparing for the competition, the rules, and entry forms are available by following this link. 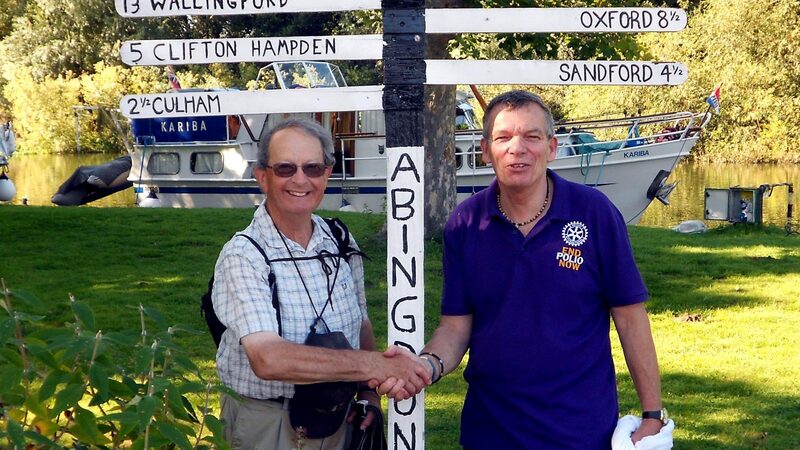 Club member Tim Bryce continues his Walk of the Thames Path from Lechlade to Teddington in London. (125 miles), raising funds for our ongoing project in Sierra Leone, establish by Alan Wolstencroft, this year’s Club President, for developing Education – helping to finance, classrooms, equipment, sanitation and clean water. On the morning of Friday 15th July, Club members and partners visited the Griffiths Centre (GC) building at Frank Wise School.Â This kind invitation had been extended in acknowledgement of Club having sponsored two GC students each year since 2012 to attend the Calvert Trust, Exmoor. After serving refreshments, students Tim and James gave a short presentation on their recent experience at their activity weekend with the Calvert Trust. 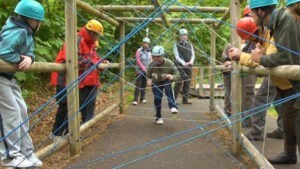 There, participants with physical, sensory and learning disabilities can experience exciting, challenging and enjoyable outdoor activity adventures such as archery, canoeing, zip wire and abseiling, and assisting other less capable participants in organised and social group activities. The immediate challenge that Tim and James faced was that, although the course was fully accommodated and catered, they had to be individually independent outside their carefully supervised activities. This was the first time that either student had been away from their regular home and school comforts and support of familiar staff or family, or having to organise themselves to such an extent without prompting. Truth be told, James found it quite difficult to cope with his newfound independence and had some behavioural difficulties initially. However, after encouragement with GC staff over the phone, and with Tim’s support, James recovered to take full advantage of the weekend. This experience will prove invaluable in the near-term as James is about to leave Frank Wise to take a three year placement at a further education establishment in Cornwall that will train him in the hotel trade. Tim has another year at GC after which he hopes to take a place at Banbury & Bicester College. It has always been very satisfying for Members to hear direct personal feedback from this project, normally during a routine Friday talk. Club is extremely proud to have worked with students and teachers from the Griffiths Centre at the Frank Wise School, and the Calvert Trust, Exmoor, and the Youth Services committee has recently recommended to Council that this sponsorship should continue in 2018. Rotarians from across the water shake hands. 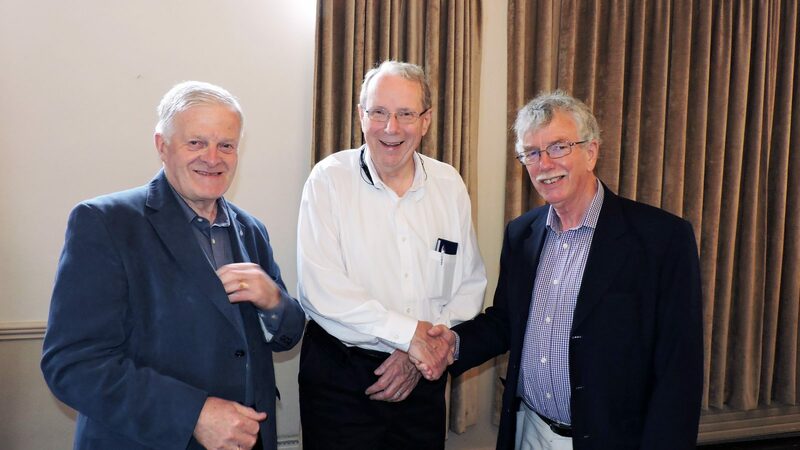 Banbury Rotarians Fred and John, and our visitor Rotarian Don Healey from Indianapolis, USA who came to our recent club meeting during his recent visit to his relations in Brackley. Don sent us a significant contribution to our “End Polio Now” concerts campaign that was held in the spring this year. He was welcomed by Fred who organised the concerts and John who received his contribution on behalf of the club, and was heartily thanked for his donation. Don said he always considered Banbury to be his second home due to his family connections and knew he was amongst friends when he came to see us as he loved the fellowship he found in Rotary especially from Banbury folk. Members of Banbury blind and partially sighted groups enjoyed a magnificent afternoon tea at Wroxton House Hotel. Welcomed and thoroughly spoilt by John Smith, his family and staff. 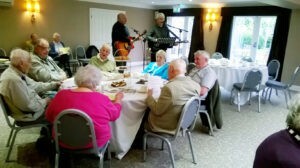 Nigel Deakin and Ian provided entertainment on guitars with jokes and a sing-a-long of well known 1920’s tunes. A vote of thanks for the hospitality was given, everyone looking forward to this annual event again next year. We use of the web to tell the world what we are doing and the world watches us as this post shows. 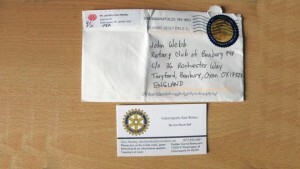 We have a Rotarian from Indianapolis who keeps in contact with us and comes to see us when he is in the UK. This is what Rotary is all about! 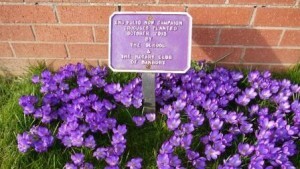 We recently had our P4P concerts (purple for polio) in St Marys’ Church in Banbury and raised £2000-00 towards our target for the year from this club. We hope to raise upward of £7,000-00 for this cause before the year end for the polio eradication programme. To get back to our friend Don Henley, he not only watches our website but also becomes involved in some of our activities so THANK YOU DON for your input and as a visit from you is now on the cards for this year we will buy you lunch and a good pint of bitter, together with bit of banter and a lot of fellowship. Greetings from our club to all your members in Indianapolis East Rotary Club, but don’t invite our lot for a free meal as they will eat the restaurant out of food! The two Rotary Clubs in Banbury are once again this year organising a local heat of the Rotary national competition, and the winner will then subsequently represent Banbury in the next round that is scheduled to take place in February 2017. The competition is open to anyone of secondary school age and under 17 on 31st August 2016, and is being managed in a similar fashion to previous years. The first round locally will take the form of a paper submission of a proposed menu; a judging team will review these and competitors will be selected to take part in the local final as in previous years. The local final will be taking place on January 17th 2017 at The Banbury and Bicester College, Broughton Road, Banbury and those selected for this will be asked to prepare and cook their chosen meal for a panel of judges who will be in attendance. All finalists will be provided with the opportunity to visit the College to see the facilities to be used before the final takes place if they would like to. The local winner will go forward to the Rotary District/Regional final and the winner from the latter then takes part in the National Final. This is being sponsored by Filippo Berio Olive Oils and will take place in Lincoln in May. The National winner will receive the RIBI Trophy (and a replica to keep) plus £250. In addition they will receive a day’s experience at the Fifteen Restaurant in London. Please click here to download a copy of the details of the competition with the entry form at the back. Entries must be submitted to Malcolm Douglas, Henry’s Menswear, 52 High Street, Banbury, OX16 5JJ by 16th December 2016 at the latest.